« Leaf cleanup services. Mulching or removal? Dealing with grass clumps on bi-weekly customers. 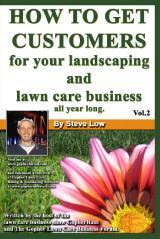 There are lawn care customer that will call you when they feel their grass needs mowing, in order to save a few dollars. If you take such customers on, you will probably find these lawns require a lot more of your time and end up looking bad when you are finished with them, no matter what you do. 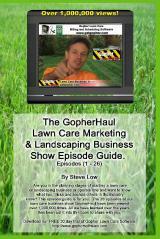 In this discussion, from the Gopher Lawn Care Business Forum, we hear from one entrepreneur who is dealing with a customer complaining about grass clumps left on their lawn. What should you do about this if it happens to you? One lawn care business owner wrote “I have a 42″ ztr mower that I have been using for a while now and some of my lawn care customers constantly complain about grass clumps after I mow their lawn. Now keep in mind I go over some of these yards 2 or 3 times and it still looks clumpy. These aren’t weekly customers they are at least bi-weekly if not longer between cuts. Some even tell me to not show up until they call me to cut their tall grass. A third shared “I would tell your customers the reason there are clumps, is because you are cutting too much off the top. Either tell them it needs weekly mowing or at the very least try every 10 days. I hate working for people who are too cheap to maintain a lawn properly, yet expect it to look perfect. I can only do so much with what I have to work with. If you cut 2-week tall, crappy grass, it’s still gong to look crappy. I hate working on these lawns because it reflects poorly on ME. I don’t want the neighbors asking ‘who cuts your lawn?’ when what I’m forced to leave behind is not up to my standards. Next season, the last of my ‘on demand’ mowing customers are going to be looking for another service provider. I am constantly dropping yards that are not profitable for me and that only want me cutting once or twice a month as I get better paying customers on my mowing route. During a summer, in my area, you can’t let a yard go for more than two weeks without cutting it or you will be there for hours. If these customers want their yards to look nice then they have to take care of them and can’t cut corners. I let them know up front that it will be more money per cut if it is not on a weekly schedule. They have to understand that if I don’t raise my price, I make no profit on their yard that is twice as high as it should be. It is also harder on my lawn care equipment and costs more in fuel. If they want some kid to come and play that on demand mowing game with them then they are more than welcome to do so but my company will only take on profitable jobs that will represent who we are. As early as the middle of my first mowing season I had to drop about 10-12 clients who we realized we were wasting our time with. The customers we stay away from now are the ones that are always asking for discounts or looking for ways to not spend money when it comes to basic services. The good customers understand you are running an actual business and have to make a profit. This entry was posted on Saturday, February 28th, 2015 at 2:19 pm	and is filed under How to Estimate - Services To Offer, How to Estimate Jobs, Lawn Care Business, Lawn Care Customers, Lawn Mowing, Mower, Mowing, Pricing, Problem customers, Residential Customers, lawn care equipment. You can follow any responses to this entry through the RSS 2.0 feed. You can leave a response, or trackback from your own site.